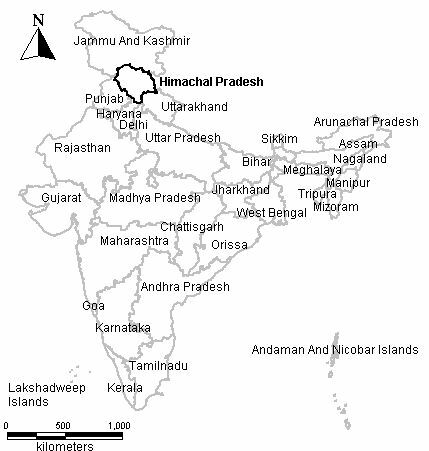 Himachal Pradesh (Figure 1) is located between 30.38° to 33.21° North latitudes and 75.77° to 79.07° East longitudes in the western Himalayas, covering a geographical area of 55673 km2. The State is divided into 12 districts surrounded by Jammu and Kashmir in the North, Tibet in the Northeast, Uttarakhand in East/Southeast, Haryana in South and Punjab in Southwest/West, with an abundance of snow fed perennial rivers and rivulets. Out of the total area, 37033 km2 is managed by the forest department and 16376 km2 is under permanent snow cover . The agro-climatic zones of Himachal Pradesh are classified based on its elevation above mean sea level and related biogeography. 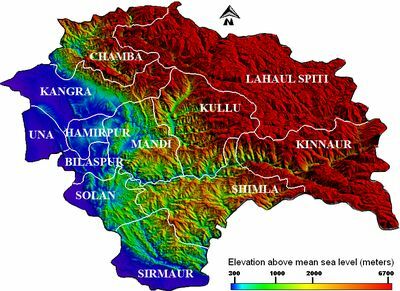 Parts of Una, Bilaspur, Hamirpur, Kangra, Solan and Sirmaur districts in the Western and Southern regions lie below 1000 m with a tropical to sub-tropical climate and respective vegetation. 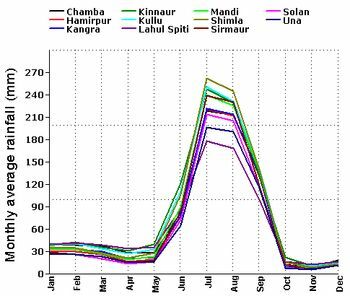 Some portions of Solan, Sirmaur, Mandi, Chamba and Shimla districts at altitude between 1000-3500 m have climate conditions varying from sub-tropical to wet-temperate with elevation. Lahaul Spiti, Kullu and Kinnaur districts ranging between 3500-6700 m are part of the dry-temperate, sub-alpine and alpine zones with very sparse rainfall. The Digital Elevation Model (DEM) based on 90 m resolution SRTM data (http://www2.jpl.nasa.gov/srtm/) along with district boundaries of the state provide clearer understanding of its topography (Figure 2). 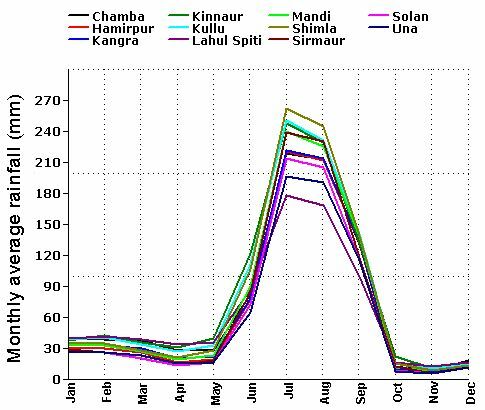 The spatial and monthly variations of average rainfall (Figure 3) and temperature (Figure 4) over Himachal Pradesh have been observed from a 100 years meteorological dataset. 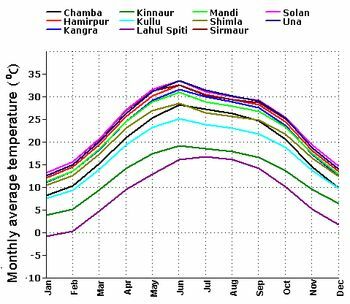 The monthly average temperature decreases with altitude and shows a regional difference of approximately 15° C from higher elevations (above 3500 m) to lower (below 1000 m). Winter season commences in the month of October, reaches its peak in January and continues till February. The months of March, April, May and June are comparatively warmer. Figure 3 clearly shows the onset of Southwest monsoon in June with average rainfall uniformly reaching higher values in all the regions. The highest annual average rainfall is recorded in the district of Kinnaur and the least in Una. The rainfall slows down towards the end of September marking the end of the southwest monsoon season. IMD has an ordinary solar radiation station in Himachal Pradesh which is situated in Manali at 32.27° North latitude and 77.17° East longitude measuring GHI. The data from the station do not suffice for a higher temporal and spatial scale study of solar energy availability throughout the state. Hence, larger spatiotemporal resolution satellite-derived solar resource datasets were collected, scrutinized and validated for the study region. Citation : Ramachandra. T.V., Gautham Krishnadas and Rishab Jain, 2012. Solar Potential in the Himalayan Landscape., International Scholarly Research Network, ISRN Renwable Energy, Volume 2012, 13 pages. Energy & Wetlands Research Group, Centre for Ecological Sciences, Indian Institute of Science, Bangalore – 560 012, India. Centre for Ecological Sciences, Indian Institute of Science, Bangalore – 560 012, INDIA.